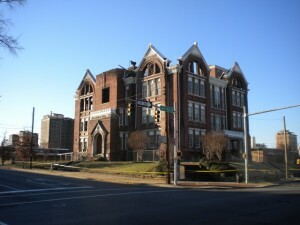 Another iconic structure in Birmingham is about to be torn down – Powell School. And a last ditch effort is underway to restore it for a new use. I hope you saw this article in the Birmingham News on May 31st, 2011 “Historic preservationists deserve a chance to see if they can restore Powell School, which was damaged by fire in January” Ironically, Bob had recently completed the watercolor (below) that was to be used to attract attention and perhaps funding and redevelopment for the school before it burned. So what now? Here’s the remaining shell below. We drove by again this morning and the damage is extensive and heartbreaking. Obviously the roof is gone, and the upper floor has collapsed. The $500,000 in insurance mentioned in the article above is just a drop in the bucket for restoration. In order to save Powell School, this project will ne ed a purpose and benevolent committed patrons who believe in that purpose with deep pockets. FOOD REVOLUTION SHOULD BE HERE! WHAT IS THE FOOD REVOLUTION? “We’re losing the war against obesity in the US. It’s sad, but true. Our kids are growing up overweight and malnourished from a diet of processed foods, and today’s children will be the first generation ever to live shorter lives than their parents. It’s time for change. It’s time for a Food Revolution. If you haven’t seen the popular show, here’s the link. Thanks to dedicated volunteers, Birmingham already has an edible garden for kids close by with Jones Valley Urban Farm. So, Birmingham has Sam Frazier, a local historian who’s spearheading the movement to save the school. It has Mayor Bell’s encouragement. It has Frank Stitt, and Chris Hastings – both award-winning chefs who support the movement. It has Whole Foods. It has the new FoodBlogSouth and lots of food editors spawned by Southern Living. Birmingham is really a food town and we should be leaders in this movement. But sadly, Alabama ranks #2 of the fattest states 2011, and Birmingham ranks #10 among the fattest cities 2011 in America. Our legacy can be better! And back to Powell School…It’s got classrooms, a cafeteria, meeting areas, and history. It’s near Jones Valley Urban Farm, and hundreds in our city know and love it. The Food Revolution has the support of the nation, and the backing of First Lady Michelle Obama, along with lots of stars including Paul McCartney, Justin Bieber, P Diddy, Jennifer Anniston – well, read the names for yourself here. There are nearly a million people (and the numbers are growing every day) who’ve signed a petition in support of the Food Revolution. It could be SUCH A POSITIVE THING FOR BIRMINGHAM! Is it possible to hope that THE FOOD REVOLUTION could save Powell School, too? 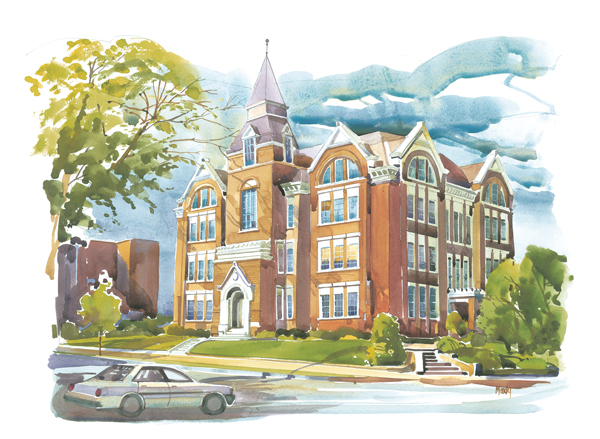 This entry was posted on Friday, June 3rd, 2011 at 2:52 pm	and is filed under Architectural Renderings, Birmingham Information, Birmingham Paintings, History. You can follow any responses to this entry through the RSS 2.0 feed. You can leave a response, or trackback from your own site.